The Heron Bay Homeowners Association is set to win the lawsuit they filed against the City of San Leandro, concerning the City’s decision to give a height variance to Halus Power Systems to build a wind turbine tower on their property, for research and testing purposes. The HOA objected to the turbine for aesthetic reasons, but grounded their legal pleadings on assorted – though very weak – environmental concerns. Still, the judge overseeing the case issued a tentative ruling (TR) granting the HOA’s petition that Halus obtain an environmental impact report (EIR) on the project. The EIR would cost Halus hundreds of thousands of dollars and may very well prompt the small wind turbine company to move out of San Leandro. The City is challenging the tentative ruling and a hearing has been scheduled for February 11. Judge Evelio Grillo, somewhat unusually, did not post the actual contents of the TR online and, instead, only e-mailed it to the lawyers. It’s thus impossible to actually comment on his reading of the case. However, it’s rare for a judge to change his position once a TR is filed. 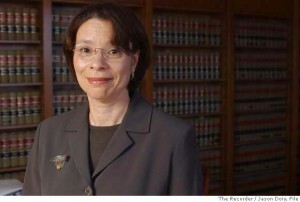 Best known as the judge in the Jahi McMath case, Grillo has a reputation for being smart and “by the book.” Still, the City’s attorney – in particular, Meyer Nave‘s Edward Grutzmacher, who seemed to be the principal litigator in this case – didn’t precisely ingratiate himself to Grillo by getting involved in petty legal shenanigans early in the procedures. Now, Halus and San Leandro taxpayers may be paying for their lack of professionalism. When plaintiffs sue a city under the California Environmental Quality Act (CEQA), they need a copy of the administrative record detailing all the proceedings on the matter before the different City bodies. This has to be assembled and certified by the City and the plaintiff must pay for it. 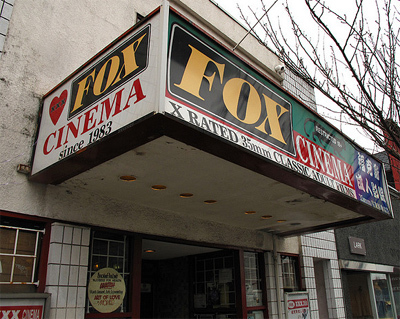 The City estimated that it would cost between $4800 and $6200, which the plaintiff’s lawyer accepted. The City started compiling the record, but did so at a slow pace. There are e-mails after e-mails from the plaintiff’s lawyer asking for updates on the status and cost estimates of the compilation. Replies by Grutzmacher were less than responsive. Finally, Grutzmacher said the record was ready but the HOA’s attorney could only have it after delivering a $24K+ check. He contended that it had taken 187 paralegal hours to compile the record, each charged at $125/hour. He would not, however, give an actual accounting of how they came up to that amount and instead held the record hostage – though at one point, he gave the HOA’s attorney a one-time, take-it-or-leave-it opportunity to get the record for about $20K. Finally, the HOA’s attorney had to ask the Court to force the City to give them the record. The Court ruled that they could have it upon payment of $6200. While I am the Heron Bay’s HOA number one critic – I thinks this lawsuit is an abuse of process, based purely on prejudice and animus by the HOA’s leadership -, the behavior of the lawyer representing the City was just as contemptible. The impression I got after reading the e-mail exchange between Mr. Grutzmacher and the HOA’s lawyer, was very much that Mr. Grutzmacher was playing a game: first denying the HOA’s lawyer the information he needed, then holding the record hostage by demanding an absurd amount of money, and then, when the HOA’s lawyer asked for an explanation of the charges, by falsely claiming that the HOA lawyer wanted to get the whole thing for free. Mr. Grutzmacher’s behavior on e-mails and pleas was not only childish, but offensive. We can speculate how the judge reacted to Grutzmacher’s attempt at gamesmanship. We will not know Judge Grillo’s reasons for ruling for the HOA until the hearing – unless one of the parties decides to release the brief or some enterprising journalist goes to the trouble of obtaining it -, but we do know that it’s likely that these legal shenanigans will cost the taxpayers plenty. If the HOA wins, the City will not only be stuck with having to pay its own attorney costs, but also the $25K Grutzmacher alleges it cost to assemble the administrative record. It will also have to pay for the court costs and the HOA’s attorney’s fees, which are much greater than they would be if he didn’t have to spend countless hours fighting Grutzmacher over the administrative record. Once again, Meyers Nave profits from getting the City into a legal mess and the taxpayers are left to pay for it. This was a case that the City should have won easily. But Meyers Nave has shown that it either lacks the competence or the will to actually offer sound legal representation for the City. Indeed, the tens of thousands of dollars their botched representation will cost this City in this case pales in comparison to the almost $3 million the City lost on the Faith Fellowship case, the $4 million+ it lost on the former Albertsons’ property case and the almost $8 million it lost on the King Family Trust lawsuit. While these were all lawsuits that the City should not have had to face to begin with – and wouldn’t, if they had gotten competent advise from the let go -, Meyers Nave poor representation definitely did not help along the way. I said it almost three years ago: “It’s time to fire Meyers Nave” and it’s even more true today. San Leandro’s taxpayer money should go to pay for fixing our streets, housing our homeless and providing after-school activities for our children. It should not go to pay for expensive lawyers who give the City bad legal advice, and then benefit when the City gets sued. It’s worse than I thought, but is it intentional or just careless? Just ask public officials, perhaps over a few beers, how they feel about the pesky public looking over their shoulder as they try to “get things done.” They hate it. Public oversight means they have to worry about following the law, hiding any corrupt deals and being held accountable for their actions. As the corruption facilitated by secrecy has dire consequences for society at large (just think of the City of Bell), the California legislature long ago passed the Brown Act to guarantee the public notice and access to government meetings, and the California Public Records Act to grant access to government documents. Local governments have been trying to skirt them ever since. I have noted before actual and threatened violations of these laws by the San Leandro City Council. Recently, I’ve become aware of a number of recurring and and very serious violations that allow the City Council to deliberate secretly. I’ve given the City the benefit of the doubt – perhaps nobody at City Hall is actually aware of the law or perhaps they’ve just been careless – and I’ve written to City officials* requesting that they cease these violations. How (and whether) they respond, and more importantly whether they actually comply with my request to obey the law, will be very indicative of the trustworthiness and ethics of our City Officials and our City Attorney. The City Council agenda for Feb. 6th, 2012 lists “Conference with Real Property Negotiators” as one of its closed session items. It says that they are currently negotiating the “price and terms of payment” with Innisfree Ventures II, David Irmer’s development firm. This implies that the City Council has already agreed to sell the former Albertson’s property to Irmer, or at least has discussed it; you don’t negotiate a price for a property you are not ready to sell. The Brown Act requires that any discussion on the sale of the property as well as any instruction to the City Manager (or anyone else) to initiate negotiations for the sale of the property, must be done in open session, after being properly agendized. A search of the agendas, minutes and other public records in the online Public Records Database maintained by the city, did not produce any records of such discussions or decisions. It would appear that these discussions were made informally or in closed session, in violation of the law. The City Council publishes agendas both for its open and closed sessions. Closed sessions usually start at 6PM and open sessions at 7PM. Agendas for closed sessions are labeled “Closed Session” while those for open sessions are labeled “Regular Meeting” or “Joint Meeting with Redevelopment Agency.” I was just informed by the City Clerk, however, that a portion of the meeting labeled closed session is actually an open session, in which the City Council can transact all sorts of business, including making required announcements. But as the meeting is not labeled “open session,” or “regular meeting” or anything other than “closed session,” the public has no reason to know that this is a meeting they are free to attend. The results are that practically nobody is likely to go to these meetings, and thus nobody witnesses what was said or not said there. The City Council Fails to Keep Minutes of the “Open/Closed Session” Meetings. California law requires the City Clerk to “keep a correct record of [City Council] proceedings”, and indeed, minutes and/or recordings** are produced and posted online for regular open session meetings. This does not appear to be the case, however, with respect to open/closed meetings. For example, there are no minutes for the Dec. 13th, 2010 open/closed session, even though a number of people (including myself) attended and made public comments at that meeting. So basically we have a situation in which the City Council seems to 1) be holding public meetings without alerting the public about it, 2) not including all items to be discussed in the agenda and 3) not keeping minutes of those meetings – all in violation of state law. 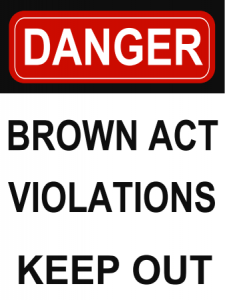 The Brown Act allows the City Council to meet in closed session to discuss exposures to litigation against the City. However, the law also provides that the closed session agenda must describe the “facts and circumstances” which have exposed the City to litigation, except when such facts are not known to the potential plaintiff. A quick look through a sample of City Council agendas from 1998 on suggests that those facts and circumstances are never disclosed, even in cases where it’s very clear that the potential plaintiff is quite aware of what those facts are (e.g. the murder of Gwendolyn Killings and the disagreement with Dan Dillman about the use of the Bal Theatre). The disclosure of this information is very important for the public as it allows San Leandrans to keep a closer tab on how the City is fulfilling its legal obligations towards the community. A plethora of circumstances that make litigation against the Police Department likely, suggests that there are serious troubles with that institution. The City Attorney’s judgement that the City may be sued for employment discrimination or Brown Act violations, will shine some light into what’s going on at City Hall. Litigation is also very expensive, so it behooves the public to keep a close eye on what the City is doing to bring about lawsuits against it. I find this pattern of violations of Open Meeting laws to be very disturbing. I can only hope that they will be addressed immediately by our City Officials. I will keep you posted of any response I receive. – * I sent my initial e-mail to Mayor Stephen Cassidy, City Council Members Michael Gregory, Ursula Reed, Diana Souza, Joyce Starosciak, Pauline Cutter and Jim Prola, City Attorney Jayne Williams, Community Relations Representative Kathy Ornelas and City Clerk Marian Handa. Handa responded to that message, also copying City Manager Chris Zapata and Assistant City Manager Lianne Marshall.